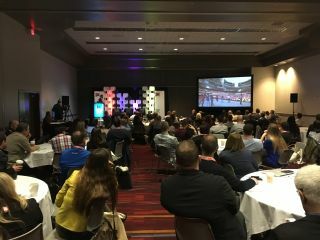 At the Society of Experiential Graphic Design (SEGD)’s Branded Environments during the Digital Signage Expo (DSE) in Las Vegas, NV, Justin Wood of Dimensional Innovations discussed extending the brand experience in sports. Here’s quick recap of his thoughts, broken down into four different categories one should consider with the audiovisual user experience (UX). “The days of sponsors being okay with that [just a logo] as their brand recognition—those days are over,” Wood said. “They need to be experiential. Whatever we do in the space needs to support the brand, it needs to support the team, and ideally, they’re in really, really close alignment.” Experiences need to have a wow factor so people stop and spend time there, which brings values to the fans and the sponsoring company. As an example, he pointed to the Pittsburgh Penguins hockey team, and credits the success of their sponsorship program to the alignment of the company’s sales team in putting the right brand sponsors with the right activation. For example, aligning the Blue Cross Blue Shield with the Kids’ Zone when the company had “really deep roots” with amateur hockey leagues in the area, or connecting their hall of fame with a media conglomerate that was able to help with hall of fame members. The goal of the project should be to make an entire area work together as one holistic system instead of a series of random sponsor activations. For Wood, the design process has to include a constant balance ensuring “the architecture, the design, and the sponsorship spaces all sing together.” For example, wayfinding, lighting, and artwork need to work in concert with the concession and retail design. Sponsorship can be the trickiest part of designing the experience. Some people have worked on similar projects and have a strong vision, while others haven’t done a major activation and don’t even know where to begin—and there’s often a steep learning curve, even with a brand-savvy company. Wood frequently has to remind sponsors that “their space is not going to keep this stadium from opening, so you got to stay on path, got to stay on target.” Hitting those deadlines is crucial. “The design process is a very iterative process to help them make sure we’re hitting all of the goals but also make sure we’re staying within budget, and can actually build what we’re going to build,” Wood said.